This mini-me mixing surface intrigued us when it was announced, but is it actually worth buying? FaderPort works well enough, but smart cookies will wait and see how it compares to Frontier´s AlphaTrack before splashing out. …That needs its own power. Fairly expensive for what it is. Not customisable. While MIDI control surfaces are nothing new, it's fair to say that they're becoming increasingly specialised. 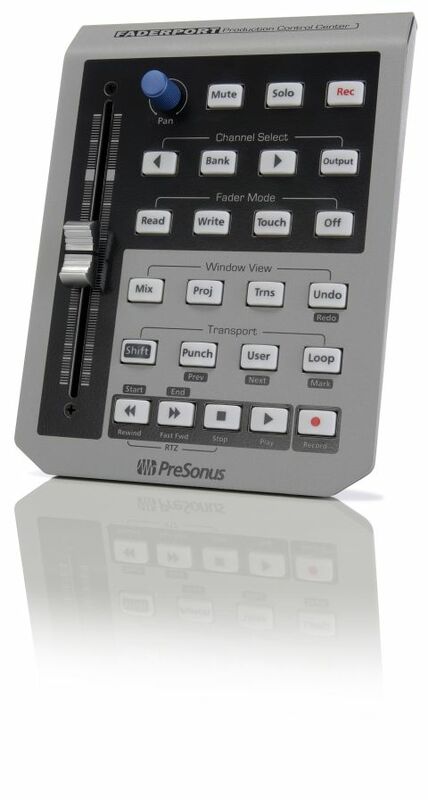 PreSonus's FaderPort, for example, is aimed at the producer who wants hands-on control of their software's mixer but doesn't have the space for a unit such as Behringer's BCF2000 or the Mackie Control Universal. Rather than replicating an entire mixing desk, the FaderPort offers just a single fader and a handful of controls. The fader itself is OK - it's a standard 100mm affair that's satisfyingly sensitive - but it's pretty light and 'plasticky' and doesn't really reflect the FaderPort's asking price. But while a more luxurious fader would have been nice, the construction quality of the unit is by no means poor, and the fact that it's fairly light means it scores brownie points for portability. One cool touch is that the fader is motorised: it glides between different levels as you change tracks. However, while the FaderPort can be powered by USB, you have to use the bundled PSU if you want the motorised fader functionality. This means mobile users will probably opt to do without it, but at least the option's there. As well as the fader, the interface features a pan pot (which is, thankfully, an endless rotary encoder), transport controls and a selection of other buttons for navigating your mixer, muting and soloing tracks and changing the fader's mode. The buttons are good enough - a little stiff but extremely sturdy-feeling - and they light up pleasingly when pressed. The Fader Mode controls enable you to select read and write automation options, which means you can record precise fader automation without having to resort to using the mouse. FaderPort doesn't require any kind of installation - just plug in the USB cable and you're good to go. The device starts sending MIDI information right off the bat, and while there's no way to customise its output, the manual and website feature patches and instructions for setting it up with the popular DAWs. We tried it with Cubase 4 first, and after following the painless installation and configuration walkthrough in the manual, we found the integration to be pretty perfect. FaderPort is a well-conceived and executed piece of hardware, but it seems a little expensive for what is basically a luxury, and it will soon face stiff competition from Frontier Design Group's AlphaTrack. If you simply must have hardware control of your DAW and don't mind splashing out, though, it's a worthy purchase.